I did a 83km trip from Laura to Maytown in far north Queensland, I had my exhaust torn off & a big sill panel dent for my experience, but it was worth every moment. 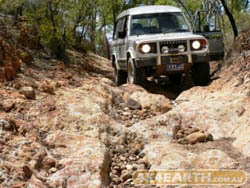 I did this trip just before Christmas in 2006 with a friend, he had never been 4WDriving so it was even better for him, he could not believe where we went & how we got through some of the terrain, especially in a car that was 21 years old, the only mods done on my Pajero were rear suspension stiffend & lifted, & a Warn 8500 pound winch, its 2.6 petrol which I modified myself for more power, I overhauled the head & opened & polished the ports, & put a 130 Webber Carby on it, & its fuel consumption is better but still a thirsty guzzler. Check the pictures I have displayed & if anyone wants some more info or pics just email me & I will share them no worries.